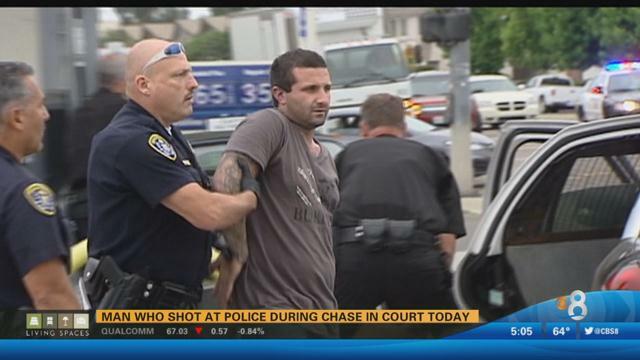 A man accused of firing several shots into a Carlsbad police car during a high speed chase last week, disabling the cruiser but causing no injuries, pleaded not guilty Monday to a slew of charges, including attempted murder of a police officer. Cameron Avery Valentine, 27, was ordered held on $1 million bail. The events that led to Valentine’s arrest began about 3:30 a.m. Wednesday, when an auto burglary was reported in the 2300 block of La Costa Avenue in Carlsbad. A witness told investigators the possible perpetrator drove off in a light-colored truck, according to Carlsbad police. Later, an officer spotted a vehicle matching the description of the getaway vehicle and tried to pull it over on Palomar Airport Road, but the driver sped off, Carlsbad police Lt. Mickey Williams said. As the officer gave chase, the suspect fired seven or eight rounds toward the pursuing squad car, striking the front of it twice, said Deputy District Attorney Michael Runyon. The officer was not hit. The chase continued into San Marcos at speeds exceeding 100 miles per hour. After several miles, the police car broke down due to the gunfire damage, and the suspect got away, but was taken into custody in Clairemont the next day, according to Runyon. A subsequent search of an apartment in Escondido turned up the tailgate of the suspect’s truck sprayed with bullet holes, shell casings and a backpack with stolen items inside, Runyon said. In addition to attempted murder, Valentine is charged with assault with a firearm on a peace officer, shooting at an occupied vehicle, burglary and felony evading. He’s due back in court on June 24 for a readiness conference and June 29 for a preliminary hearing.